A few months ago, Juice Marketing blogged about the 5 Online Marketing Tools Every Tech VAR Should Be Using, showcasing some of the most popular (and free!) online applications designed to give you a better understanding of what makes your target market click – literally. So here’s a follow up with 5 more online marketing tools you should consider using. Social media is no longer just for celebrities and teenagers. It has become one of the most powerful channels for sharing content, driving traffic to your website, generating brand awareness, and staying top of mind with customers and prospects. And when you have the proper tools and analytics to manage your online marketing efforts, you’ll discover that social media can be an extremely powerful and insightful form of marketing. 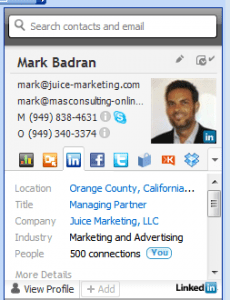 XOBNI – As you click to read email, you see the senders profile on LinkedIn, Twitter, etc. right in Outlook. Cleverly named Xobni (inbox spelled backwards), this free Outlook plugin and mobile application brings your email and social worlds together seamlessly by creating social media profiles for your email contacts right inside your inbox. With Xobni, you’ll be able to see a picture of anyone that sends you an email, along with links to their Facebook, LinkedIn, Google+, and Twitter accounts right next to their email address. Xobni makes it easy to build your LinkedIn connections, increase your Twitter following, and stay in contact with business colleagues – all with a single click, without ever leaving your inbox. Simply put: it allows you to incorporate social media into your everyday regimen of checking and responding to email. Besides the obvious social media benefits, Xobni is also a great tool to help you manage all of your email communications and conduct faster searches. Xobni organizes the files, conversations, and links exchanged with a given contact into a nice little summary that displays alongside their inbox profile. Twitter has a 140 character limit per tweet. So in order to share articles and blog posts with your followers, it’s important to shorten the links first. There are many link shortening tools out there, but a Juice Marketing favorite has to be Bitly. Bitly does so much more than convert long URLs into Twitter-friendly bits. It also tracks the click-through rate of the shortened links you’re sharing and archives the information so that you can analyze which links and content are resonating most with your followers. Note: In order to get access to all the statistical data and archived tweets, you need to take just a few minutes and set up a free account with Bitly. Bitly allows you to analyze which shared links resonate with your social network and which ones don’t. BufferApp is the smartest way to schedule and post the great content you find online. This batch sharing tool takes the time and stress out of social sharing. Simply load up your account with the articles you’d like to share and let Buffer take care of the rest. It posts the articles in consistent intervals over several days so you don’t annoy your social network with 10 posts in a span of 5 minutes. With Buffer, you can grab a cup of coffee, sit down on Monday morning, catch up on your reading, and schedule an entire week’s worth of tweets, LinkedIn shares, and Facebook posts in one sitting. Using the optional Buffer extension for your web browser, you can share right from the article you’re reading. No need to separately launch the Buffer interface. Google Analytics is a must-have application for any website, but surprisingly not everyone is takes advantage of this free tool. Google Analytics provides the insight and detailed statistics you need to evaluate website performance. At first, the volumes of data provided by Google Analytics can seem overwhelming. But even if you focus on just a few key metrics initially – like traffic volume, keywords, and referral sources – you’ll still have a wealth of valuable information at your fingertips that’s easy to digest. Ever wonder how many people visit your website each month? Where that traffic is coming from? Or even what keywords people are using to find your website? Google Analytics is the tool that answers those questions … and more. Once you get your feet wet, you’ll discover that Google Analytics even tracks your top content, best-performing pages, what devices and operating systems visitors are using, social media engagement, and so much more. Google Analytics provides insight and detailed statistics on website traffic, keywords, page performance, etc. 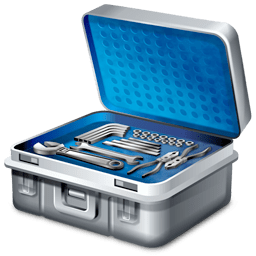 Even though this last recommendation is not necessarily a “marketing” tool, we couldn’t help including it in this list because of its practical use and free price tag. Join.me is an online screen share app that gives you the ability to share your desktop with anyone, anywhere. The uses for Join.me are endless: demonstrate software to prospects, troubleshoot issues with customers, collaborate on projects, train remote staff, and so much more. Join.me allows you to get on the same page with your customers, prospects, and team members – without being in the same room. Now It’s Your Turn: Which online marketing tools do YOU use & recommend?